The service at Ambush was awesome the when I visited early October after their new menu launch, so I had to bring Coffee & Cravings there for a meetup. We gathered on Deepavali evening for a dinner and Ambush kindly blocked off one section of their restaurant for our meetup, plus provided us with two $30 vouchers to giveaway for prizes during the dinner! The service was awesome once again with special thanks to manager Jeremy. It was great to see some new faces in our Coffee & Cravings group along with some members who attend regularly and some who have attended one or two previous meetups. 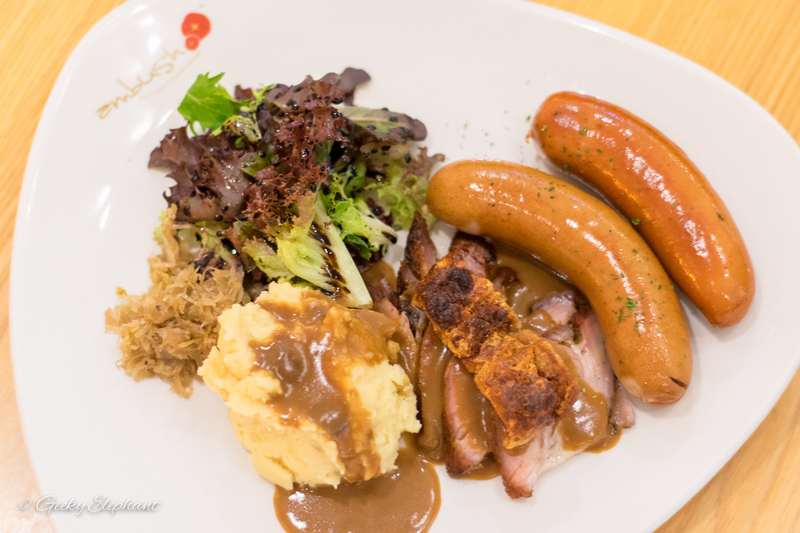 I had the Oktoberfest Platter ($17.80++)—includes pork knuckle cutlets, smoked bratwurst, bockwurst sausages, sauerkraut and potato puree. The sausages were really good with a smooth texture which I like. It would’ve been better if there was more pork knuckle crackling. Overall the dish is worth the price paid. I would probably go with the sausage platter instead next time. 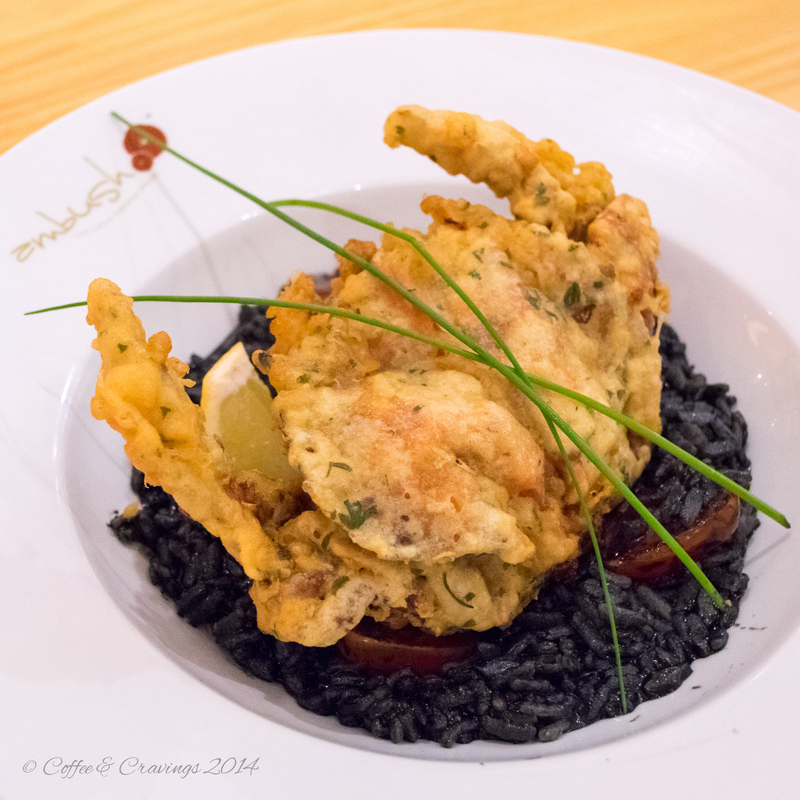 The Risotto Al Nero (Squid Ink Risotto) with Soft-shell Crab ($18.50++) is a good choice to go for. The crab is really flavourful, slightly crunchy and goes well with the squid ink risotto. Some of the other photos taken on the night. 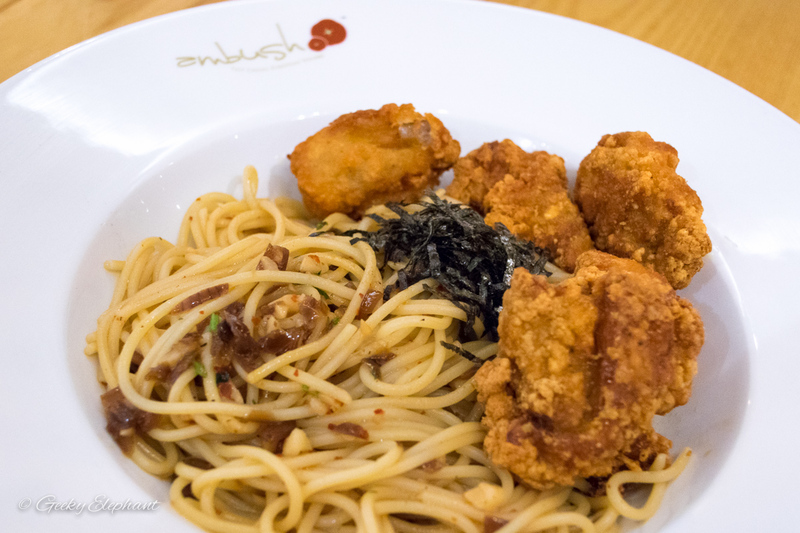 Ambush: Spaghetti Aglio Olio Con Pollo Croccante—Crispy Chicken, Seaweed, Onion, Garlic, Chilli Flakes & Olive Oil. 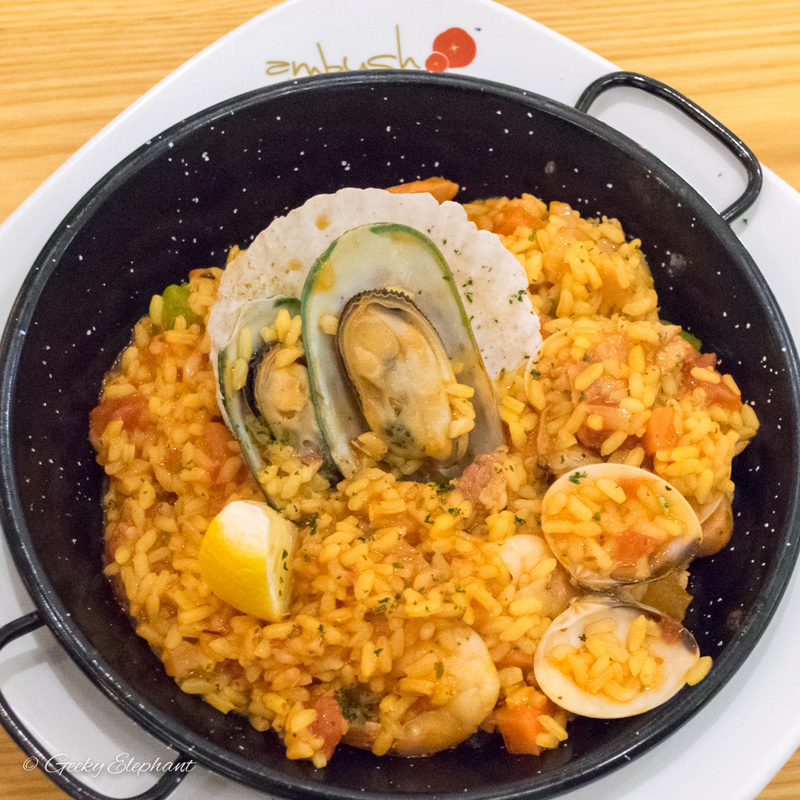 Ambush: Ambush’s Paella—Pancetta, Sausages with Market Seafood. 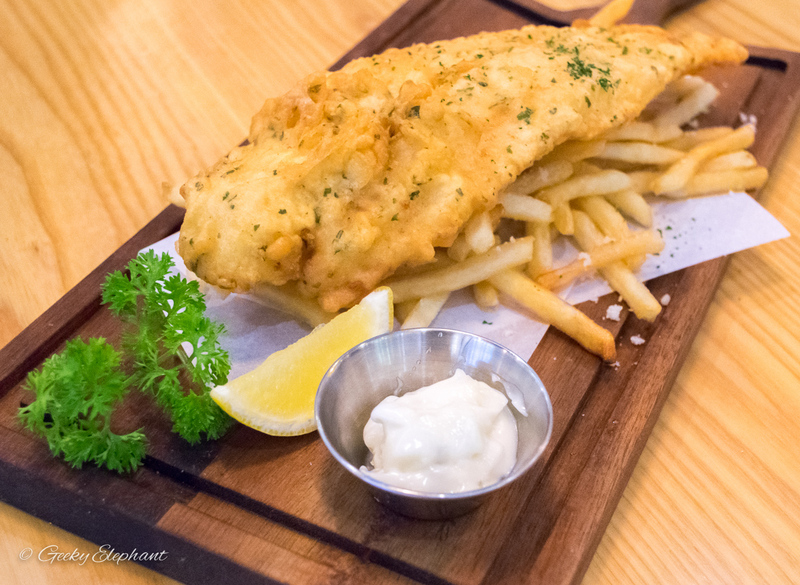 Ambush: Signature Fish & Truffle Chips—Beer Marinated Fish Fillet with Truffle Fries. 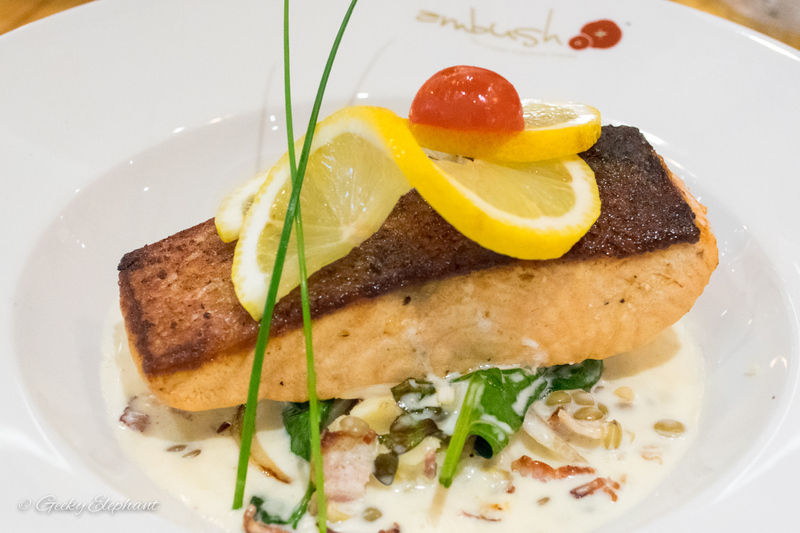 Ambush: Pan Seared Salmon & French Lentils—French Lentils, Pancetta & Spinach. 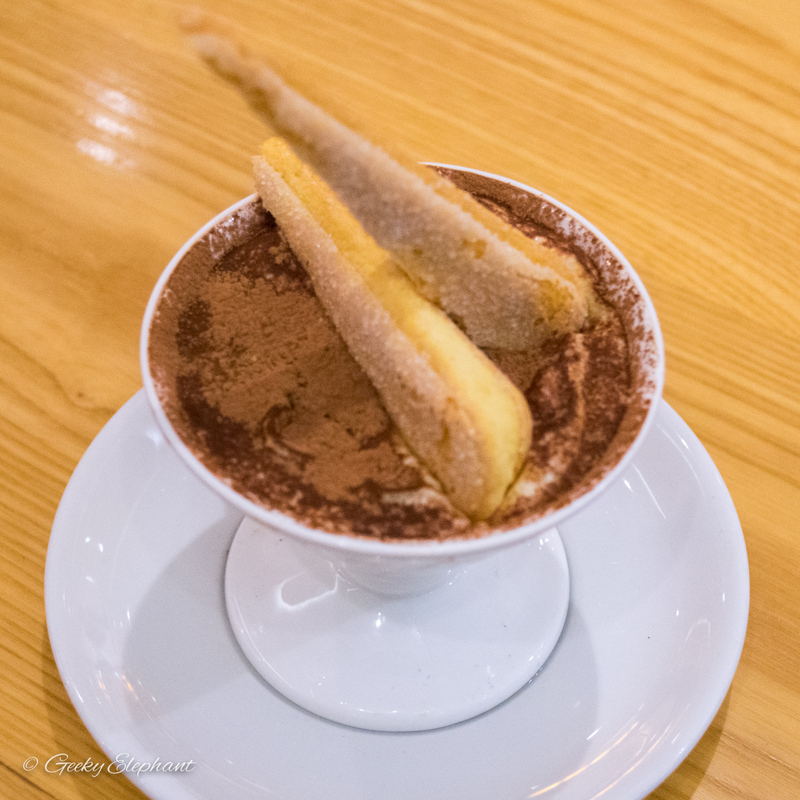 Ambush: Tiramisu—Mascarpone Cheese, Coffee, Brandy with Chocolate Dust. 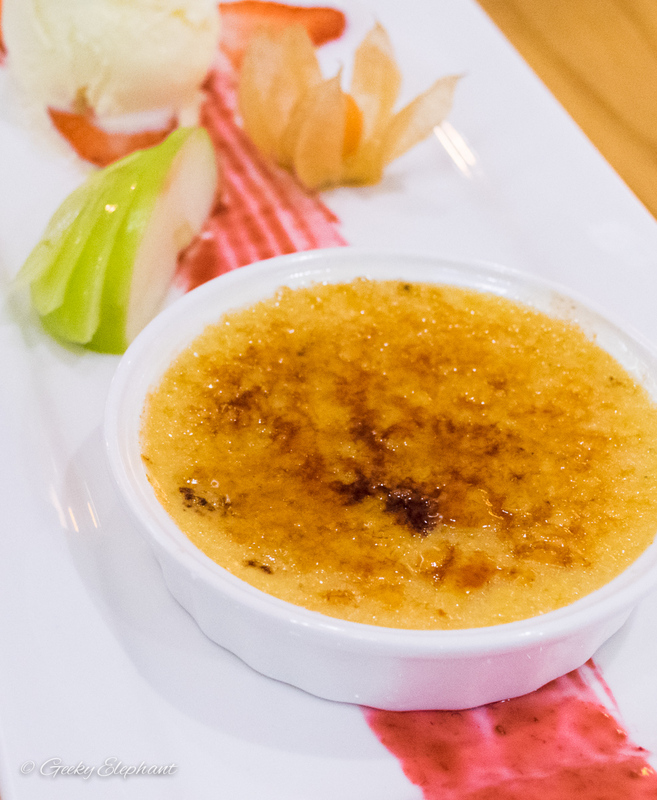 Ambush: Baileys Crème Brulee—French Custard, Bailey’s Liquor, Crispy Caramel Shell with Vanilla Ice Cream. It was an interesting night with Coffee & Cravings and good practice as an organiser for activities. I’m learning it’s a little hard to get everyone to move around from their seats and mingle with everyone else. I tried playing a game to have everyone move around so that I could give away one set of vouchers. But the anticipation kinda dwindled by the time we waited for everyone to finish their desserts and for the tables to be cleared up cos everyone was eating at different speeds, but can’t be helped I guess. Will have to improve for the next meetup. All in, it was a great night and a good mix of members new and regulars. Thanks to Ambush for their lovely hospitality and their super helpful manager Jeremy at Plaza Singapura’s outlet. This is a really good place for group eat-ups!